The German domestic appliance manufacturer wanted to demonstrate why top chefs and local food suppliers are passionate about using their products. Brief2Event were asked to build a creative concept and produce their most high profile event of the year for 250 of London’s high-end kitchen designers. Called Designer Event 2017, the event historically has been held in ‘quirky’ venues across London, but this year the challenge was to hold up to 300 delegates and have space to build different rooms for the delegates to go through a ‘journey’. Delegates were taken conceptually through Miele’s philosophy of ‘Precision. Passion. Perfection’ - navigating a mix of unusual and interesting spaces filled with props and features. Brief2Event wanted to create an immersive journey through the ideas behind these principles using quirky venues, such as MC Motors and The Factory in Hackney, London. This involved a presentation demonstrating the importance of precision engineering. Brief2Event were responsible for finding the venue, creating the concept as well as designing and building the event. They also organised audio visual, delegate management, branding and print, build management, catering and more. The first presentation focussed on precision engineering and standards, with celebrity chef Anna Hansen discussing the importance of accurate results in the professional and home kitchen. Miele works closely with food suppliers who have a "passion for producing quality, locally produced products at the heart of their business". So delegates were taken through a ‘passion’ themed room, which was filled with market stalls from local food and drink suppliers. The delegates worked around the market stalls to hear about the passion of their brand and why they entrust their produce to Miele. The room then opened up to reveal four Miele kitchens showcasing a variety of kitchen ranges for delegates to discover, and allowing them to play with the products. 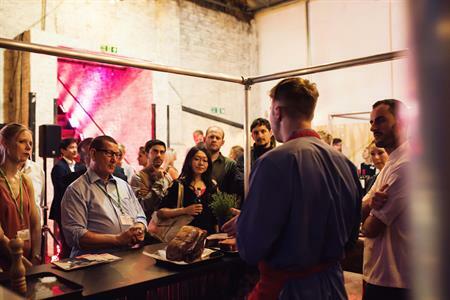 "Once again [Brief2Event] took our vision, ideas and concepts and brought them to life in one of the biggest productions we have ever undertaken," said Michaela Uzzell, Miele's event manager. "Managing 150 guests throughout an immersive journey required a production and support team who were efficient, proactive, highly organised while being specialists in their own area – all of which were the case. [Brief2Event] are well connected and have a wealth of experience, which such project and production required."